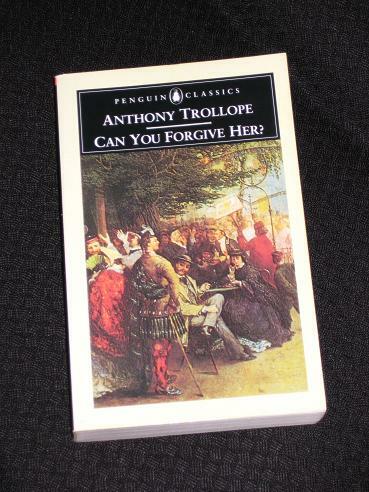 Can You Forgive Her?, by Anthony Trollope, is the first of the six books known as The Palliser Novels, and it’s a good book in its own right. It tells the tale of Alice Vavasor, a young woman who breaks off her engagement to the worthy John Grey because she feels that she is unsuited to the kind of life he is planning to lead, a secluded, leisurely life on his country estate (which sounds wonderful to me). After making this decision, she begins to gravitate back towards a former love, her cousin George, whom she decided not to marry earlier in her life because of his terrible behaviour towards her. As Alice moves closer towards throwing her lot in with her impulsive (and possibly psychopathic) cousin, Trollope ask the reader a couple of questions: will Alice regret her decision, and, more importantly, can you, the reader, forgive her? Funnily enough though, as well designed as this side of the story is, I really couldn’t care about Alice (or John Grey) at all because the main order of the day is our first lengthy introduction to one of Trollope’s favourite characters, Plantagenet Palliser, and his bubbly wife, Lady Glencora. Palliser previously appeared in a bit role in The Small House at Allington, but here he takes centre stage as the character who will occupy the writer’s mind for the next decade or two. In fact, Palliser is the character who best represents Trollope’s own opinions and beliefs – the epitome of the English gentleman -, and his relationship with his wife is a masterful, realistic depiction of love and companionship. Rather than taking us up to the wedding day and then leaving the loving couple to live happily ever after, Trollope has married off a young heiress, against her wishes, to a good, but unloving, politician – and then stirred in a little unresolved tension with an old flame. Over the next five books, we will see how, from an unpromising beginning, the relationship will blossom and grow into a true love match, despite the many bumps along the way (especially in this book…). I’ve read this story several times, but I still wolfed it down, devouring the 800 pages (of admittedly large type) in just four days. I simply love this kind of Victorian novel, where multiple plot strands are teased out over hundreds of pages (and, in the original format, over years – Can You Forgive Her? was originally published in twenty monthly parts…). You know what is likely to happen – that is if Trollope doesn’t actually tell you himself -, but the destination is relatively unimportant; it’s the journey that matters. And when that journey involves the wonderful Pallisers, the terrible George Vavasor and a cameo appearance from the writer himself (in the guise of a heavyweight literary fellow gamely following the hunt over the English countryside), it’s a very good journey indeed. 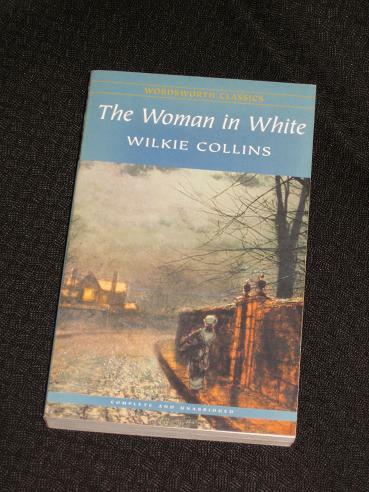 My final book for the month, Wilkie Collins’ The Woman in White, is a slightly different novel to my usual Victorian reads. It’s a mystery, set in the Victorian era, and one of many ‘sensational’ novels of the time. However, despite being lumped in with a multitude of other crowd-pleasing novels, Collins’ work is a quality piece of writing with a groundbreaking style. Anyone who has read the book will know though that the most impressive character is that of the inimitable Count Fosco, a villain of the highest order, but with the most impeccable manners. Belonging less in a Victorian novel than in a James Bond film, the mysterious Italian emigré, a magnificently intelligent, courteous (and corpulent) mountain of a man, plays with his pet mice and birds, bursts out into impromptu arias and effortlessly plots a monstrous crime without breaking into a sweat – all assisted by his sinister, devoted wife. What sounds like overexaggerated melodrama is raised above this by the book’s format; Fosco is described by several of the narrators, each fleshing the Count out in a slightly different way, all (willingly or unwillingly) admitting the power of his persona. In this way, Fosco becomes larger than life, a seemingly unstoppable genius, which makes the danger Hartright and his friends find themselves in seem palpable to the reader. I’m not really one for crime novels, but The Woman in White is far more than just a detective story – it is a fascinating account of the lengths people will go to to get money, and a superb character sketch of a criminal mastermind. Whether you are a fan of this genre or not, it’s well worth the effort. So alas, Rereading July has come to an end. Over the past month, dear reader, I have travelled far and wide through Victorian England: over hill and dale; through the bucolic Wessex landscape and up to the pleasant farm lands of the Midlands; up to a wild and wintry Yorkshire and across the Pennines to industrial Manchester; down to the great capital, the centre (at the time) of the civilised world and back up to the far-flung desolate north-west. This is my country; at least, this is the country I visit in my imagination. The more Victorian literature I read, the fuller my image of the England of the past becomes, and the more I want to know. I’ll be back very soon. Love your description of Count Fosco in The Woman in White! I just recently finished reading it and loved it. Thanks Sarah 🙂 He's certainly a colourful character, and I had a brief Twitter chat with a couple of people yesterday about his, shall we say, creepiness! ← BBAW is Here Again!